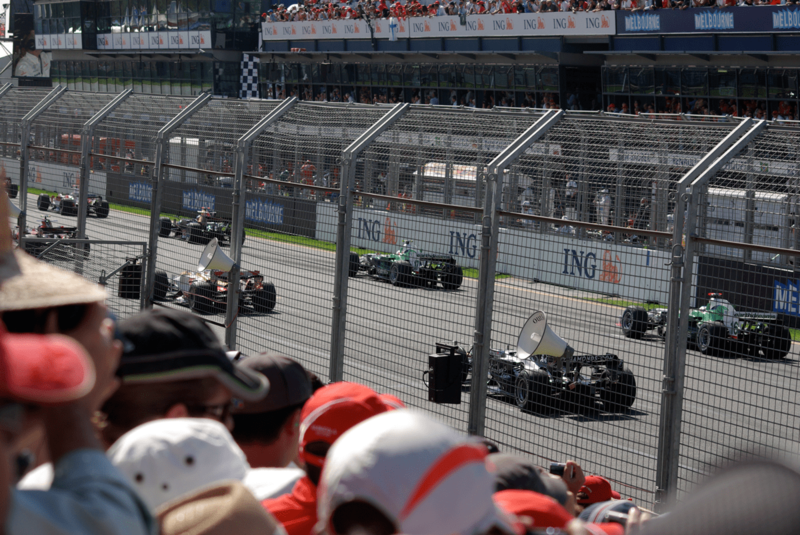 For its often action packed races, strong support events, and all round atmosphere the Australian Grand Prix is one of the greatest events to visit on the F1 calendar. Sadly, the Grandstands at the Albert Park circuit fail to deliver the ideal spectator experience and you’ll look back on your photos and curse all that catch-fencing. There are some exceptions though and the availability of multi grandstand tickets really sweeten the deal. General admission areas really save the day with some very reasonable views of the track and for a fraction of the cost. Like most main straight grandstands its not about the racing but everything else you’ll get to see from here. The Fangio grandstand is the place to be for the build up to the race, the start, the lightning fast pitstops and the post race interviews and podium celebrations. At a track like Albert Park where there is little wheel to wheel racing and overtaking whichever corner you’re at, its not a terrible idea to snap up tickets for the Fangio grandstand on Sunday. My tip though would be to select Fangio for Friday as part of a ‘3 corner’ ticket so you can enjoy the people watching and comings and goings in the pitlane during practice but be somewhere with at least the potential for action on race day. The Webber grandstand lays at the tail end of the main straight but far too far from the grid, the pits or the final turn to see anything worth getting out of bed for. The kindest thing I can say about this grandstand is that it does have a big TV screen you can look at. If you don’t have a television in your house, this grandstand might be for you, though for a lot less money you could just go and look in the window of your local Harvey Norman. The Moss grandstand could be described as a ‘poor man’s’ Jones grandstand but don’t let that put you off – it offers good views for this price range. The stand is located on the outside of the circuit between the starting grid and turn 1. It provides a view of the often action-packed turn 1 and although its too far away to be a really satisfying vantage point you could do a lot worse. Considering the eye-watering price tags of the other first corner grandstands, the Moss grandstands is great value and the best choice of seats in the low budget price range. The Jones grandstand at Melbourne is located on the exterior of the circuit, adjacent to the first corner. Unfortunately for most seats, your view up the track to where the pitlane exit is, is obscured by trees. The lower rows can see this far, but any row below about row J has their vision compromised by the catch fencing. It’s far from an ideal view, but still a great spot to see F1 cars under breaking and then struggling for grip as the drivers get on the power while negotiating turn 2. Overtakes are common here, and you can expect plenty of action on lap 1. The Brabham stand just edges out Jones as the overall best grandstand at Albert Park. Located at the interior of turn 1, you see drivers entering from the tight left-hander before getting on the power for the long, curved left that leads to turn 3. 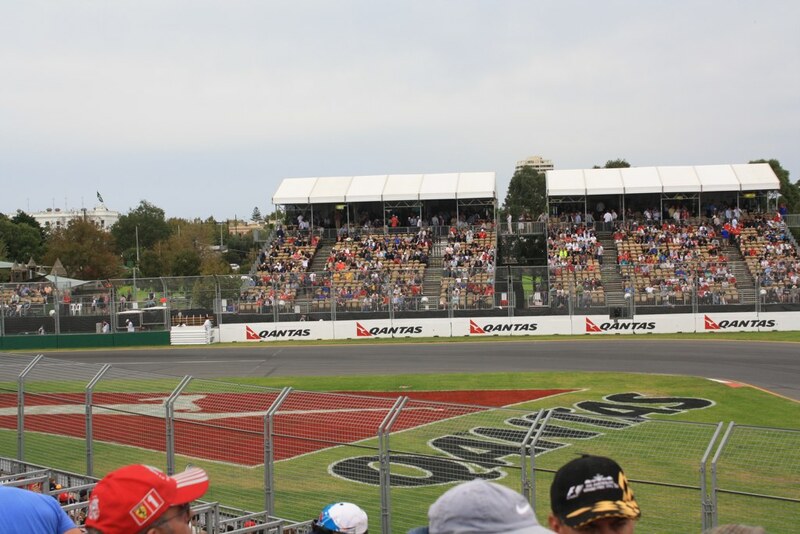 The stand is ideally placed for the thrills and spills that often accompany the first lap of the Grand Prix in Melbourne and it’s one of the most common sites for overtakes. Blocks D,E and F are a slight advantage, offering a view more of the front of the car and less of the rear. Seats in the upper rows of the stand have a clear view of the apex to turn 1 making it a great choice for keen photographers. Later in the day though the angle of the sun can cause issues. The Brabham stand is also ideally located for many of the extra attractions at Albert Park centered around the F1 Village so you won’t be bored between track sessions. The scene of several horror crashes over the years including Martin Brundle’s airborne escapades in his Jordan in 1996 and Fernando Alonso’s faithful recreation 20 years later in his McLaren. Turn 3 can feel a lot like turn 1 on the opening lap as the cars are still very much bunched together. Throughout the race too there is potential for action as the circuits second favourite spot (after turn 1) for overtakes, attempted overtakes and sometimes re-overtakes as drivers continue to battle through turn 4. Be aware that from many seats in the grandstand the view of turn 4 will be hindered by trees so its best to not expect anything other than a view of turn 3. What a turn it is though. Formerly the World Champion Grandstand the view from the Ricciardo Grandstand is one of the most expansive vistas at the circuit (admittedly that’s not saying much) letting you see all the action from the distant turn 3 around turn 4 and disappearing towards turn 5. 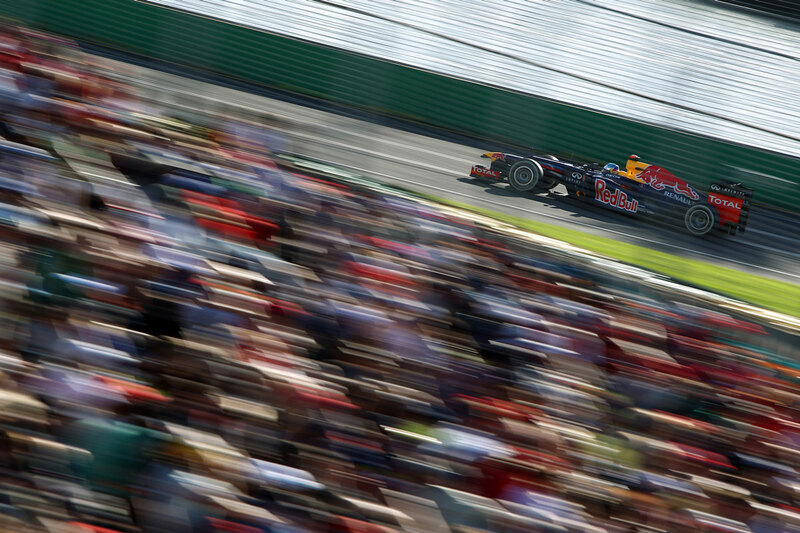 Turn 3 is no stranger to action and overtaking attempts often continue through turn 4. While not at all a poor view, tickets are sold as a premium package so a lot of what you’re paying for are the added frills like the nearby dedicated catering area and bar. The backdrop of the shimmering Albert Park lake is probably the best at the circuit and its what rescues the Clark stand from being completely mediocre. The view of the track from here of cars breaking hard into turn 9 and accelerating around turn 10, obscured by safety fencing (of course) is a bit of a let down by comparison, and the screen opposite is not ideally placed. If you’re prepared to get to the track early, the nearby general admission area offers better views of turn 9 and the accompanying screen. The Waite stand offers an alternative to the typical Albert Park view of cars braking into 90 degree right-handers and tearing away towards the next similar corner. Turns 11 and 12 are a fast, sweeping section of track and always a pleasure to see a Formula One car thread between the rumble strips, flicking left then right all in the blink of an eye. Overtaking is rare but not impossible through here and yes, catch fencing is a problem, as always. Though the Waite grandstand has the best view of this section of track if you want a similar view without the grandstand price tag head for the ever popular general admission area nearby known as Brocky’s Hill. Just don’t go on Sunday though as unless you’re willing to get up at the crack of dawn you won’t be able to squeeze in. Here’s a little bonus trivia for you. 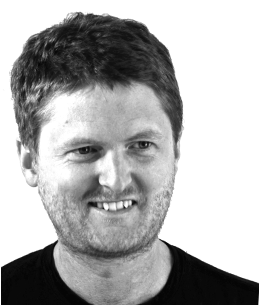 You might be wondering just who on Earth is Waite and what’s he doing in such esteemed company as F1 legends like Senna, Fangio, Clark, Schumacher, Webber…well ok, maybe not Webber. Adelaide born Arthur Waite was in fact the winner of what is considered the first Australian Grand Prix, held in 1928 on the nearby Phillip Island circuit. Albeit from a different angle the view of the final turn is similar to that from the Senna grandstand. What elevates the Prost stand though is the view of the previous corner and being able to follow the action from the tight left-hander beside the Schumacher stand and around the fast sweeping curve on to the start/finish straight and the last few rows of the grid. Although you will clearly see the pit entry, don’t expect to see any pitlane action from here – that all takes place further down. 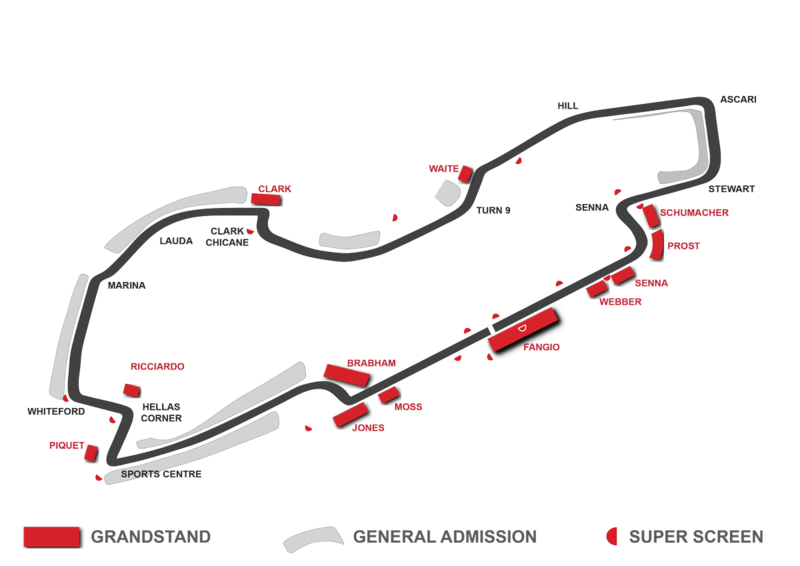 Spectators in the Schumacher grandstand can see the final 2 corners of the circuit – the tight left-hander which leads onto the final turn, a long drawn out right, wrapping around the pitlane entry – an important one to get right for a good lap time. Fans sat in the right side of the stand (blocks G, H, J) in the upper rows are in a prime position to photograph the cars in the low speed penultimate corner. At the exit of the final corner, you’re very unlikely to see overtaking from the Senna grandstand, but with corner exit being vital before the long main straight you’ll see drivers on the ragged edge of ability and grip, trying to make the best of main straight duels and crucial qualifying laps. Once in a while, they’ll go over the edge. General admission at the Melbourne Grand Prix boasts a nice variety of vantage points, some close to the track in street circuit fashion and others that offer more wide sweeping views of the track to appreciate F1 cars as they are really meant to be seen. You can and should walk just about all the way round the track. Make your way to one of the popular viewing areas that feature raised grassy mounds to enable better viewing, or just find your own little spot where you want to watch from. Of Albert Park’s many general admission vantage points Brocky’s Hill is one of the best places to watch from and regulars who have been coming for years come back to this spot time and time again. Crowded? Check. Rowdy? Check. But don’t let any of that put you off, in fact it only goes to add to the atmosphere of this little hill tribe of die hard F1 fans. Situated at turn 11 on the exterior of the track, a raised bank lets you follow the action sweeping through a fast left, right section. Overtakes are rare through here but it is an excellent example of the grip and speed of an F1 car and an F1 drivers reflexes. Take your time to look around this section of the circuit as there are a spattering of decent vantage points dotted around this fast, exciting section. A nice spot to see an F1 car’s epic acceleration ability the hill overlooking the sweeping turn 10 allows a view from the exit of the slow 90 degree turn 9 and is close to Brocky’s Hill. 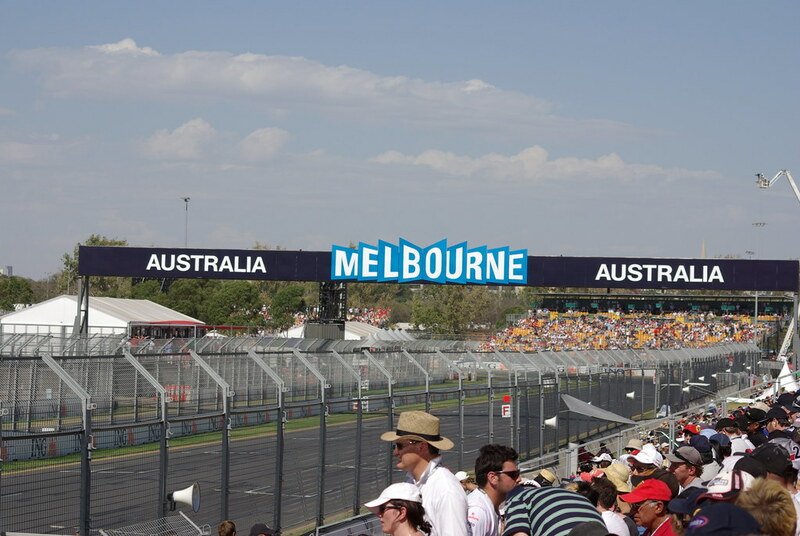 Turn 2 is another prime location for general admission at the Australian Grand Prix. There is a raised grassy bank here and if you can get a spot that allows you to see the apex of turn one you won’t be disappointed. Keen sprinters are advised that you are in the perfect position to invade the track come the end of the race and run like hell to see the podium before the champagne has finished spraying. All alone in the far reaches of the circuit between gate 4 and gate 5 is turn 6. This tight right hander, far away from everything is overlooked by many spectators but it is one of the spots that gets you closest to the action. If you’re lucky enough to find a gap in the fencing it can be an excellent spot for photographs of the cars. All in all probably not the kind of place you’ll want to plonk yourself down for the whole race, but an area well worth a look.